Once you’ve decided on a house you need a strategy to help you select the right price, terms, and conditions to get you the best deal for your dream home. We will present the offer to the seller and negotiate on your behalf. Present your offer, along with your earnest money deposit. The contract will state a timeline which your agent should explain to you, but typically the seller has 3-5 days to accept, reject, or counter your offer. Once the negotiations are done and the offer is accepted, you generally have about 10 days to complete any home inspections and renegotiate as necessary. Once an offer has been ratified, the buyer and seller will agree on the amount for the good faith deposit and set up an escrow account. This reflects the buyers intention to purchase and ensures that that no funds or property will change hands until all the conditions have been met. This is when you will apply for a loan. A contingency is a condition which must be met before a contract becomes legally binding. Some of the most common contingencies include title, inspection, and appraisal contingencies. TITLE. Your agent will help you select a title company, whose job is to examine and insure title. After researching the history of the property, they’ll certify that your title is free of encumbrances and draw up a report for your review. INSPECTIONS. 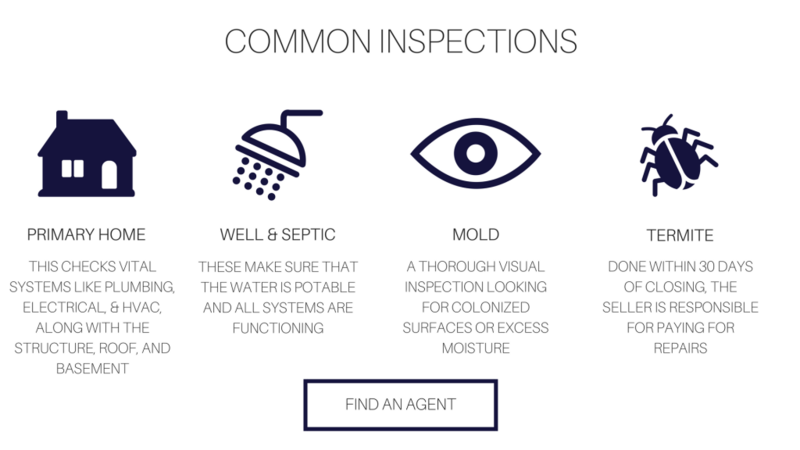 You have the right to determine the condition of the property by subjecting it to a wide range of inspections including primary home inspections, well & septic inspections, mold, termite, and radon inspections. Depending on the results, we can renegotiate terms. APPRAISAL. Your lender will schedule an appraiser from their company to come review the property and verify that the sales price is appropriate. During the application process, lenders will ask for documents to verify your income and assets and collect the appraisal fee. They will need to verify your income and employment and run credit reports. After the lender has reviewed your history and appraised the property, they will officially approve your loan. Don’t make any last minute mistakes, like quitting you job, taking out a car loan, or applying for a credit card because this can prevent your loan from going through. 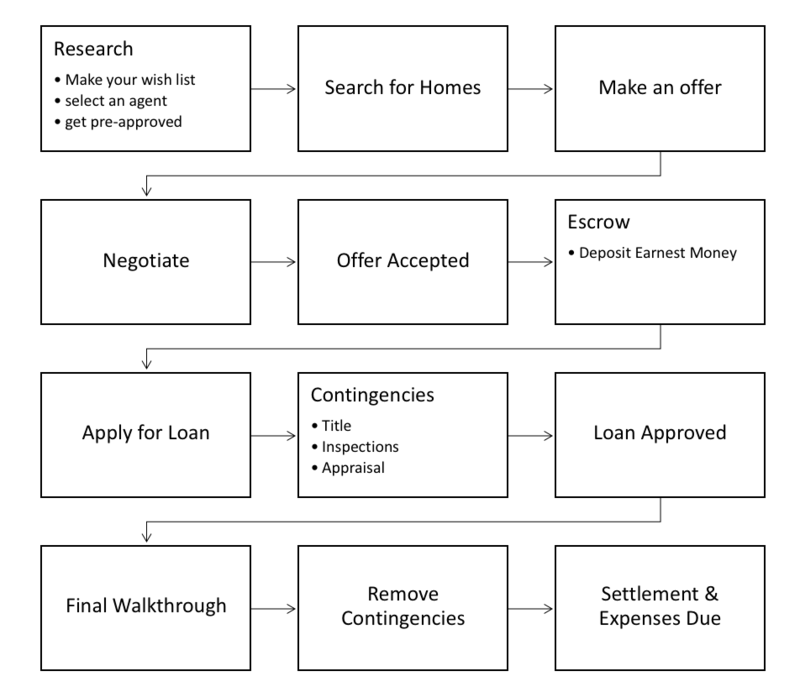 Once you have completed the final walkthrough and removed contingencies, its time for settlement. This is the transfer of funds and ownership. A title company or attorney typically acts as a independent third party to facilitate the closing. The title company also provides a closing statement, which summarizes all the financial transactions throughout the process called a HUD-1. At closing you will give a certified check and sign the final documents for the title company, who will record the transaction. CLOSING COSTS. When you go to settlement, you need to be sure to have the funds to pay for half the title & escrow fees, lender fees, homeowners, and title insurance. Get in touch with an experienced Dart Homes buyers agent & start your search today!